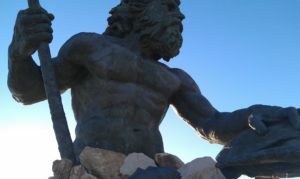 VIRGINIA BEACH, Va. — Neptune, the Roman god of water and the sea, is the majestic poster boy for an annual festival that draws 500,000 visitors to Virginia Beach and its storied boardwalk each September. So naturally, a trip with my daughters over spring break to this city on the Atlantic Ocean begins by paying homage. A half-hour after checking into our oceanfront room at the Best Western, we’re standing in front of a 34-foot-tall bronze statue of the merman at the corner of 31st Street and the beach, oohing and aahing over his giant trident and girly-girl curls. To cast the figure in 2005, sculptor Paul DiPasquale went through 80 tons of clay, 25 tons of plaster and a whopping 1 ton of glue. Photos of us mugging for Mom’s smartphone immediately are posted on Facebook. Turns out, snapping pics with Neptune is as much a tradition for vacationers as standing in line for frozen yogurt at Kohr Brothers, angling for spot off the fishing pier at 15th Street, or shopping for $5 T-shirts and hermit crabs on Atlantic Avenue. That’s because in Virginia Beach, unlike other high-rise, high-traffic beach towns on the East Coast, the focus is very much on simple family pleasures. For more than 100 years, the town’s main attraction has been its pretty boardwalk, which today stretches 3 miles along the ocean, and its even more picturesque beaches, which are wide and clean and don’t require a beach tag for entry. In all, there’s more than 30 miles of coastline, divided into three beaches with distinct personalities. Gentler waves can be found in the quiet waters of Chesapeake Bay Beach to the north of the main resort area, while on more secluded Sandbridge Beach, the focus is on the pristine sand dunes and fluttering sea oats that make you feel as if you’ve (finally!) managed to get off the grid. Depending on budget, vacationers here can rent quiet beach bungalows or oceanside palaces that sleep 20. It’s a little more commercial on Resort Beach, with runs from the designated surfing area at Rudee Inlet to 40th Street, but charmingly so: The dozens of souvenir stores, pizzerias, arcades, ice cream and candy shops and boutiques offering henna tattoos lining Atlantic Avenue feel very old-fashioned. Got a yen for saltwater taffy or fudge? Forbes Candies has been making it since 1930. Rather put butterflies in your stomach? There’s a Ferris wheel among the kiddie rides at the beachside amusement park on the boardwalk at 15th Street. Or maybe, like so many families who gather on the beach as the sun goes down, you’d rather take advantage of the wonderful ocean breezes and fly a kite. The twilight sky is full of ’em. Sadly, my daughters and I aren’t coordinated enough to maneuver kite strings, so instead we spent our evenings strolling the boardwalk. We had plenty of company. Paved and lighted, this 28-foot-wide concrete promenade is where most of the off-sand action unfolds: parents pushing baby strollers, locals walking dogs, joggers, cyclists, inline skaters. 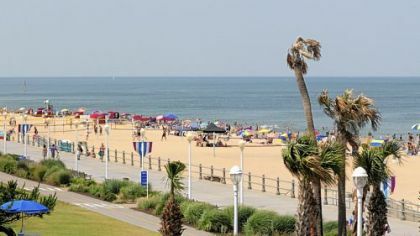 Virginia Beach also draws its fair share of surfers, hosting the East Coast’s longest-running surfing competition each year. The 50th anniversary of the East Coast Surfing Championship runs Aug. 20-26, and is expected to draw 100,000 people with its free concerts on the beach, volleyball and skimboard contests and skateboarding demos. Little could Jamestown colonist Capt. John Smith have imagined how busy this stretch of sand would become when he and his crew first set foot on Virginia Beach in 1607, after a long and arduous voyage from England to what would become the Jamestown colony. Even after a lighthouse was built on nearby Cape Henry in 1792 to help guide ships in and out of the Chesapeake Bay, visitors were relatively few. Then in the early 1880s, a railroad made it easy to travel to the coast from the busy port of Norfolk (the 18-mile trip took just 40 minutes). And when the area’s first “luxury” hotel opened in 1890, the East Coast’s gilded elite quickly followed. “Surf and still water bathing, crabbing, bowling, billiards, tennis, horseback riding, and charming drives through the towering pine forest, may be indulged in,” read a promotional booklet put out at the time by the Norfolk & Virginia Beach Railroad Co. about The Princess Anne Hotel, an elaborate hotel that occupied two oceanfront blocks. As the beach grew in popularity, more hotels and guest cottages popped up, and by the early 1900s, the place was booming. In the ’40s and ’50s, some of the biggest acts in the country — Glenn Miller, Judy Garland, Bing Crosby — performed on the bandstand at the Cavalier Beach Club, which opened in 1929 and is still in business. Today, live music and stage shows can be enjoyed at several locations close to the beach, including Broadway at the Center, Little Theatre of Virginia Beach and Sandler Center for the Performing Arts. During the summer season, there’s an array of street performances on Atlantic Avenue between 17th and 25th streets, and local and national artists crooning on small stages set up along the boardwalk. Not every beach town has a playground right on the sand, but Virginia Beach has two: one at 10th Street and another at 31st, just beyond the Neptune statue. At Second Street lies JT’s Grommet Island Beach Park & Playground, believed to be the nation’s first wheelchair-accessible beachfront playground. Opened last year, the 15,000-square-foot park features adapted slides and monkey bars, and raised sand tables for building sandcastles. Other fun activities for kids include a trip to the Virginia Aquarium & Marine Science Center (the sharks are amazing and scary) and playing goofy golf under the stars. If you’re more into history, there’s plenty to be found in the form of two period house museums (the 18th century Adam Thoroughgood House is one of the oldest brick homes in America), monuments, a Coast Guard museum that’s tucked inside a 1903 station at 24th Street and a historic village that pays tribute to the first English explorers and American Indians of the Chesapeake region. Determined to squeeze at least one educational activity into our va-ca, I dragged my daughters into the Atlantic Wildfowl Heritage Museum (1113 Atlantic Ave.) located in DeWitt Cottage, which was built in 1895 and is the oldest beach house still standing along the Virginia Beach oceanfront. I quickly learned that 16-year-old girls don’t give a hoot about antique duck decoys, though they did find sepia pictures of the beach from the early 1900s vaguely interesting. Sigh. At least it was free, which can’t be said of the henna tattoos they somehow talked me into letting them get afterward, in exchange for spending 15 minutes “having to use their brains” while on vacation. What all three of us enjoyed was everything else the beach had to offer. During our visit in early April it was too cold to go in the water, but the sand was soft and warm on our toes as we sunbathed, and the local seafood I’d read so much about, happily didn’t disappoint. 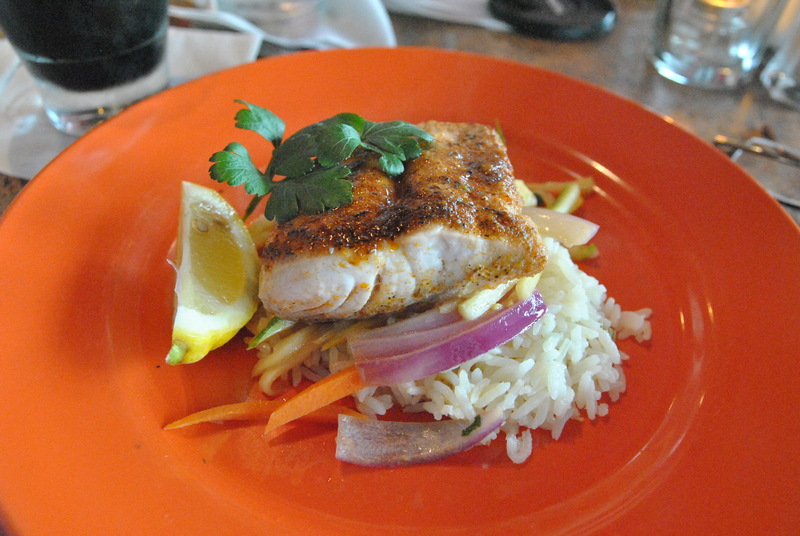 Among the delicious dishes we sampled were the crabcakes at Waterman’s Surfside Grille, the bronzed mahi mahi at Mahi Mah’s and fried shrimp at Catch 31 Fish House and Bar, an upscale oceanfront restaurant within spitting distance of King Neptune. We also had one of the best breakfasts ever at the quaint Doc Taylor’s on 23rd Street (it’s in a vintage beach cottage that once housed a doctor’s office), and terrific pancakes (short stack, with lots of chocolate chips) at Pocahontas Pancakes at the corner of 34th and Atlantic. Getting there: Virginia Beach is an eight-hour drive from Pittsburgh (482 miles) via Route 522 South toward Winchester, Va. Otherwise, you’re sure to get stuck, possibly for hours, in traffic on Interstate 495. You also can fly into Norfolk, Va., on several airlines (none offer direct service), then rent a car or take the airport shuttle for the 17-mile drive to the beach. Shuttle: $45, plus $5 for each additional person (jamesrivertrans.com, 1-866-823-4626). Sweet dreams: There are more than 12,000 hotel/motel rooms in Virginia Beach’s resort area, including most of the major chains. Our room at the 3-star Best Western Oceanfront ($138 and up during the summer season) was small but perfectly comfortable, and included a continental breakfast plus free Internet access; it also had a private balcony overlooking the beach and easy boardwalk access. For more luxurious accommodations, head to the oceanfront Hilton, Sheraton or Ocean Beach Club Resort hotels. Large groups may find it cheaper to rent a vacation home or condo on the quieter Chesapeake Bay Beach, just north of the resort area, or Sandbridge, south of the boardwalk known as the “Outer Banks of Virginia.” Rates start at about $2,000/week for a two-bedroom home that sleeps six. There also are several campgrounds with more than 1,800 tent and RV sites, and rustic cabin rentals at First Landing State Park ($831/week for non-Virginia residents from Memorial Day to Labor Day). You can camp right on the beach (tents only) at False Cape State Park, an isolated mile-wide barrier between Back Bay and the Atlantic Ocean in southern Virginia Beach, but it’ll be pretty primitive digs. Access through Back Bay National Wildlife Refuge is limited to hiking, bicycling or boating, so you’ll have to carry everything in. Make reservations at virginiastateparks.gov or by calling 1-800-933-7275. Good eats: You can’t visit Virginia Beach without sampling seafood fished right out of the Atlantic or Chesapeake Bay: tuna, flounder, rockfish, crab, oysters. One popular seafood eatery is Waterman’s Surfside Grille (415 Atlantic Ave.) — the lumpmeat crabcakes are amazing, as is its signature vodka drink, the Orange Crush. Expect to stand in line even on weeknights. For more casual dining, Virgina Beach has dozens of family restaurants. Pi-zzeria (3316 Atlantic Ave.) serves terrific gourmet pies, including one made with pudding for dessert. When you’ve tired of sun and surf: It’s hard to imagine a more pleasant venue for biking, rollerblading, pushing a stroller or going for a run than Virginia Beach’s 28-foot-wide concrete boardwalk. Active types also can rent jet skis, surfboards and stand-up paddle boards; angle for croaker, mackerel and other fish on the oceanfront Virginia Beach Fishing Pier between 14th and 15th streets ($2 to walk, $8 to fish); take an eco-tour via a kayak through Back Bay National Wildlife Refuge; go dolphin watching; or ride horses on the beach. Just across the Rudee Inlet Bridge, the Virginia Aquarium & Marine Science Center ($21 adults/$11 ages 3 to 11) boasts 800,000 gallons of aquariums, an outdoor aviary, more than 300 hands-on exhibits and a walking trail. Other beachy delights don’t cost a penny. From mid-June to Labor Day weekend, there’s free entertainment most nights — magicians, jugglers, musicians. Summer also brings the famed Mid-Atlantic Hermit Crab Challenge, this year on July 21. More info: www.visitvirginiabeach.com(1-800-822-3224) or www.vabeach.com. This time of year when so many are obsessing about eating less in an effort to fit into warm-weather shorts and bathing suits, it’s all I can do not to think about food and how much of it I can possibly stuff in my mouth. Spring ushers in the start of racing season — the city’s biggest running event, the Pittsburgh Marathon, is May 6 — and with it, the long weekend training runs that make my fellow distance runners and me feel so very hungry. This year, a record-breaking 25,000 have signed up for the city’s full and half marathons, the majority of them (56 percent) women. That means there’s a whole bunch of people rooting around in their refrigerators and pantries looking for something tasty with which to fuel and refuel their hard-working bodies. Pasta and other high-carb foods are obvious choices in the weeks leading up to an endurance event such as a marathon to assure adequate stores of glycogen, the muscle’s primary fuel source during exercise. But runners need protein, too, to help build and repair muscles, along with fat and fiber to keep them regular during training. And don’t forget lots (and lots) of water. In other words, that power bar that hits the spot so perfectly after a morning on the trails ain’t gonna cut it over the long run. It’s time to get your game on with a one-stop food that’s not just super delicious, but also super nutritious: quinoa. A member of the goosefoot family, which include beets, spinach and chard, quinoa (pronounced “keen-wah”) has been nourishing people for thousands of years. It was particularly revered by the ancient Incas, who considered the sacred seed grown in South America’s Andean mountain region chisaya mama, or the “mother of all grains.” It was so prized, in fact, that leaders planted the first seeds each season using a golden shovel and planned celebrations around the harvest, write Jessica Harlan and Kelley Sparwasser in “Quinoa Cuisine” (Ulysses, March 2012, $16.95). Spanish explorers who conquered the Incas in the 16th century destroyed the fields in which the plant was grown along with the rest of their civilization, and as a result, quinoa — declared illegal — almost disappeared from Andean dinner tables. Even after those South American countries won their independence in the 1820s, and the plant again could be freely grown, its comeback was slow. Only the poor and provincial fed it to their families. Introduced commercially to Americans in the 1980s, quinoa is still relatively unknown in many home kitchens. Which is unfortunate, because few foods can match the seed’s nutritional profile. You name it, quinoa’s got it. It’s a complete protein that contains all eight essential amino acids, it also is rich in calcium, iron, fiber and potassium, and is an excellent source of folate, magnesium, vitamin B6, thiamin, niacin, potassium, and riboflavin. And all for 222 calories a cup. Quinoa also is gluten-free, so it’s a good choice for people with celiac disease or those who are sensitive to gluten, wheat and other grass-based food products. Because it’s higher in protein and fiber than corn or wheat (the germ in its seeds makes up about 60 percent of the grain), quinoa will help you feel fuller longer. So you may actually end up eating less. Well, theoretically, at least, because once you try it, you’re going to find that you like it, even in recipes as disparate as chili, lasagna and cookies, as my family discovered. Quinoa is prepared much like rice or pearled barley in about 15 minutes — you can boil it, cook it in a rice cooker, bake or microwave it, using one part grain to two parts liquid — but the results are crunchier and nuttier tasting. It comes in four colors with varying flavors — white, which is the most common, mildest and cheapest; slightly nuttier-tasting red; black, which has the earthiest flavor and a seedlike crunchiness; and tri-color (also called rainbow), which is a mix of all three. It’s not your cheapest grain — I paid $3.99 per pound for bulk white quinoa at Giant Eagle Market District Robinson, and $8.99 for a 16-ounce bag of Eden organic red quinoa — but keep in mind that it triples in volume when cooked. Though it’s harder to find, some stores also carry quinoa flakes — good as a substitute for oatmeal or breadcrumbs — and quinoa flour. Often served as a side dish (it makes for a wonderful pilaf, especially when paired with fruit and nuts), cooked quinoa also can headline a meal in soups, chili, stir-fries, casseroles, stews and salads. Surprisingly, it’s also a great addition to baked goods and desserts. For instance, I subbed cooked red quinoa for dried cranberries in a batch of chocolate chip cookies with pretty good results. Whatever you plan on stirring quinoa into, make sure you rinse the seeds under cool running water before cooking them, to remove any traces of a bitter coating called saponin that might have escaped manufacturers’ pre-washing. Store quinoa like other grains, in a tightly closed container in a dry, cool place. The following dishes will help you fuel up for your long training runs, or bring your weary body back to life after you’ve put in the miles. I couldn’t find black quinoa so substituted red. In a small saucepan over high heat, bring quinoa and water to a boil, then reduce heat to low, cover and cook until water has been absorbed and the quinoa is tender, 18 to 20 minutes. Turn off heat and let quinoa sit for 5 minutes. Fluff with fork, cover and keep warm. In a large heavy pot, such as a Dutch oven, heat canola oil over medium heat. Add onion and saute, stirring occasionally, until transluscent and beginning to brown, 7 to 9 minutes. Add garlic and saute, stirring constantly, for 30 seconds. Add turkey or chicken and cook, stirring frequently and breaking up the meat into small chunks, until meat is cooked, about 5 minutes. Add tomaotes and their juices, kidney beans, black beans, cumin, chili powder, salt and oregano. Bring to simmer over high heat, then reduce heat to medium low and simmer, uncovered, for about 10 minutes to allow flavors to meld. Stir in cooked quinoa and simmer until quinoa is heated through, about 5 minutes longer. 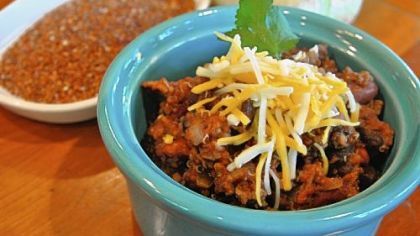 Serve hot in bowls, letting each person garnish their chili with the fixings of their choice. Serves 6. This creamy pasta dish is made with bechamel, a white sauce of cream and butter, so it’s not necessarily low-cal. But it tasted great. 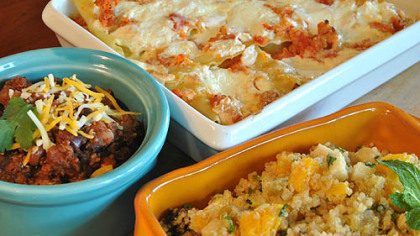 Set aside cooked lasagna noodles and cooked quinoa. Heat vegetable oil in a medium saucepan and saute onion, carrot and celery until tender, about 4 minutes. Add the ground chicken and brown, stirring, breaking it up into chunks. Add tomatoes and sugar, and season to taste with salt and pepper. Simmer for 25 minutes, or until meat is cooked through. In the meantime, make a quick bechamel sauce by making a roux with the butter and flour. Cook for 2 minutes and whisk in cream. Season with nutmeg, salt and pepper. When the meat sauce is cooked, fold in the cooked quinoa. 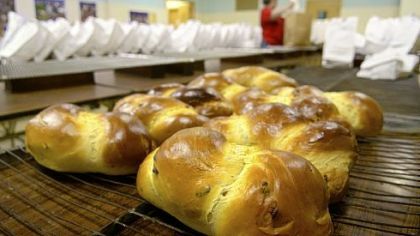 To assemble, grease a loaf pan with butter or oil. Cover bottom of the pan with 2 tablespoons of bechamel sauce. Layer with a strip of pasta noodle and then top with meat-quinoa sauce. 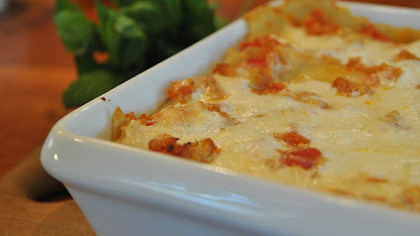 Drizzle bechamel over meat-quinoa sauce, and repeat layer(s) of pasta and sauce. Finish with bechamel sauce and shredded mozzarella cheese. Bake at 400 degrees for 20 to 25 minutes, or until cheese and bechamel sauce are browned. Serve with a salad of greens and crusty bread. This easy salad would be delicious with a variety of fresh fruits, too. In a medium saucepan over high heat, bring quinoa and water to a boil. Reduce heat to low, cover and cook until water has been absorbed and quinoa is tender, 10 to 12 minutes. Turn off heat and let quinoa sit for 5 minutes. Fluff with fork and allow to cool. Place orange segments in a medium bowl and the orange juice in a small bowl (you should have about 1 tablespoon). 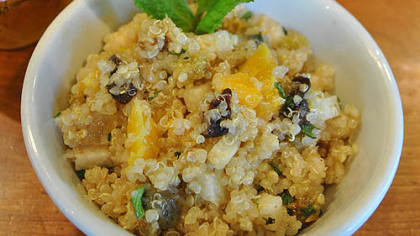 To the orange segments add cooked quinoa, dried appricots, raisins, dates, dried pineapple, hazelnuts, jicama and banana, and stir to combine. To the bowl with orange juice add the pineapple juice concentrate, honey, spiced rum (if using) and chili powder, and whisk to combine. Slowly add olive oil while continually whisking to emulsify the dressing. Add dressing to quinoa-fruit mixture, stirring to combine. Season to taste with salt and pepper. Refrigerate until cold. Just before serving, garnish with fresh herbs. Who knew you could fold quinoa into cookies, and not have your family gag? I’m guessing it’s because I substiuted chocolate chips for the craisins in the original recipe. Line 2 baking sheets with parchment paper. Whisk flour, salt, baking powder and baking soda in a medium bowl. Using electric mixer, beat butter, both sugars and honey in a large bowl until light and fluffy, about 3 minutes. Add eggs and extracts; beat until pale and fluffy, about 2 mintues. Beat in flour mixture, 1/2 cup at a time. Stir in quinoa, oats, chocolate chips and almonds. Spoon dough in 2-tablespoon portions onto prepared sheets, spacing 1 inch apart. Bake cookies until golden, 12 to 15 minutes. Transfer cookies to a wire rack and let cool. Store cooled cookies in an airtight container at room temperature for 1 day or freeze for up to 1 month. Joe and Mary Battaglia in their home in Koppel. 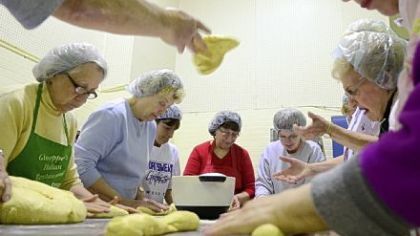 The couple started the tradition of making Easter bread at Queen of Heaven Parish in Koppel. Joe is 93; Mary is 89.